Sundt Chief Operating Officer Tom Case (second from left) and Corporate Director of Health, Safety and Environment Paul Levin (third from left) visit the Gilbert Light Rail Project. Sundt has an excellent safety record, winning the AGC Grand Award twice. Our commitment to the cause was further proven this week when company leaders visited job sites as we celebrated National Safety Week. Chief Operating Officer Tom Case and Corporate Director of Health, Safety & Environment Paul Levin stopped by four of our Phoenix-area projects to talk with the crews. While their focus was on the importance of task hazard analyses and open communication among craft and admin employee-owners, Tom and Paul also made the trip to show our company’s dedication to National Safety Week. This is the fourth consecutive year we have been a sponsor for the event, which lasts through Friday. Tom and Paul visited four sites: Gilbert Light Rail, Union Tempe, Ak-Chin Casino Expansion and a confidential client. They were joined along the way by Transportation Group Manager Jeff Williamson, Industrial Group Manager Rich Kiel and Industrial Sector Manager Greg Ayres. Their message was clear. United Rentals representatives give a demonstration at our Wilson Creek Regional Wastewater Treatment Plant project in Texas. National Safety Week got underway at our jobsites across the Southwest on Monday. The day’s theme was “Excavations, Flagging and Controlled Access Zones” and included presentations from vendors we work with to keep our employee-owners and subcontractors safe. More than 80 employees and subcontractors attended a demonstration by United Rentals at our Wilson Creek Regional Wastewater Treatment Plant project in Allen, Texas. Wilson staff were on site at 7 a.m. with a trench box, a steel or aluminum structure used for protecting workers to avoid cave-ins while performing underground work. Excavation and trenching are among the most hazardous of construction operations. Cave-ins are more likely to result in fatalities than other excavation-related accidents during trench shoring and excavation. Several of our craft professionals are new to the company and the one-hour presentation was among their first impressions of our emphasis on safety. We have been a Safety Week sponsor for the past four years. Safety Week’s mission is to raise awareness of the construction industry’s continuing commitment to eliminating worker injury, and to clearly communicate its dedication to a shared culture of care and concern. Our Safety by Choice program focuses on how and why workers need to be safe. We encourage our employee-owners to make good choices every day so they can go home to enjoy their favorite activities with family and friends. Project Engineer Ashleigh Eubank was raised in Albert, New Mexico. Project Engineer Ashleigh Eubank has been with our Industrial Group for the past year and a half. She grew up on a cattle ranch in Albert, New Mexico and graduated from New Mexico Tech with a degree in mineral engineering. 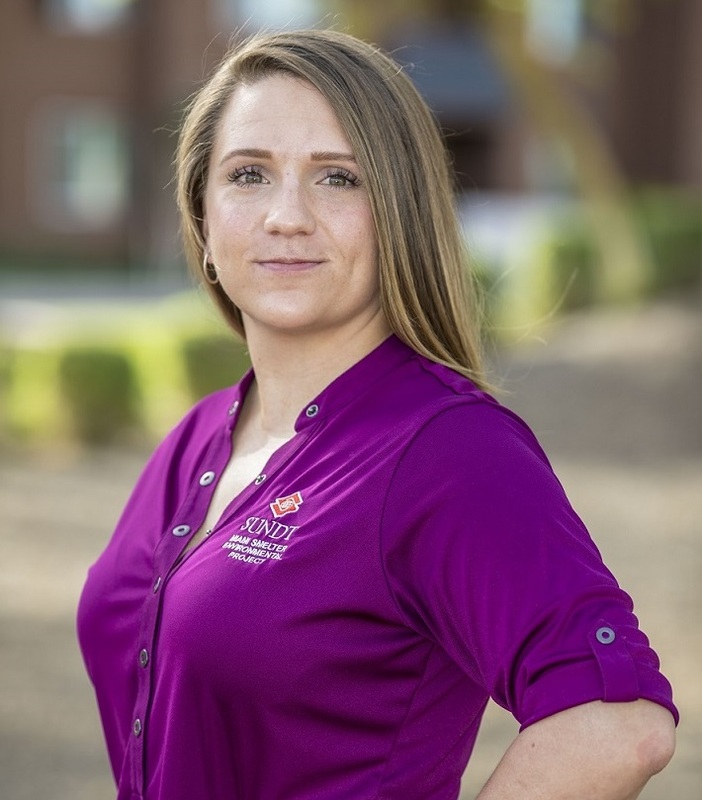 What made you want to work with Sundt? As an engineer at my previous job, I was doing a lot of design work and wasn’t getting as much out of it as I hoped. I was interested in switching things up and wanted something more hands-on. I started looking into construction and found that Sundt is a family-oriented company that takes great care of its employee-owners. The ESOP was a big plus and helped solidify my decision to apply. What does a Project Engineer do? It can vary from project to project, but we are primarily responsible for ensuring that the project design and scope are executed in accordance with the overall project plan and specifications. We are also the technical point of contact for up-to-date project information and data and assist the Project Manager as needed. How do you like working in remote areas, where many of our Industrial projects are located? I love it! I was raised on a cattle ranch near a village with a population of 70 people so I’m a small-town girl by association and prefer living a remote life. I’m a firm believer that fun can be had anywhere – all you have to do is find it and/or make it! If you could only have one type of food for the rest of your life, what would it be? I can’t live without my protein and vegetables. I can’t even think of a type of food that I don’t like. I love to try them all! So far my favorite out-of-country locations have been Turkey and Greece – I highly recommend visiting there! Other than that, my favorite place to travel is back home to my family’s ranch. If you weren’t a Project Engineer, what would you be? It’s a toss-up between two of my favorite things: water and books. So either a marine biologist or librarian. Sundt Craft Recruiter Lou Mantrom. Sundt Craft Recruiter Lou Mantrom has been part of the construction industry for 17 years, working in the human resources and recruiting fields. He has worked from coast to coast, including Alabama, Arizona, California, Colorado, Kentucky, Illinois, Indiana, North Carolina and Texas. All of his experience has been in industrial construction. What interested you about working for Sundt? The opportunity to work for a smaller construction company that’s employee-owned, to work with (Sundt Industrial Group Operations Manager) Ken Dean again and to return to Arizona. What are craft workers looking for in an employer? An employer that will keep them working, treat them with dignity and respect and show appreciation for their efforts and sacrifices. The traveling craft workforce is traveling to make a living. They’ll stick around a lot longer if you don’t treat them like numbers or herds of cattle. Money will get them here; genuinely caring for and about them will keep them here. Skilled craft workers are in high demand these days. How challenging is it to find good craft workers? With the labor crunch we’re experiencing, the loss of experience as the Baby Boomers retire and the disproportionate number of new people entering the craft workforce, finding qualified craft workers is more challenging now than it has ever been. What are the best ways for craft workers to get in touch with you to discuss job openings? First, check the Sundt careers page. That’s the most accurate and up to date information on openings. If we have openings, they’ll be posted there. I can be reached at 480-293-3258 or via Facebook as HR Lou.